The mango tree (Mangifera indica L.) is native to southern Asia. It is a member of the Anacardiaceae or cashew family. Today, the mango is a favorite fruit in many countries, including India, Singapore, Malaysia and the Philippines, and there are many popular cultivars of mango tree available worldwide. Mangoes arrived in Santa Barbara, California, in 1880. Mango trees are evergreens. They grow to heights of around 65 feet, providing pleasant shade in the process. Their early clustered leaves are often red, becoming dark green at the top and a paler green below, and quite large, usually measuring between 4 inches and more than 12 inches long. The red or yellow flowers form in panticles of about 2,000 small flowers and can cause allergic reactions among those prone to respiratory problems. Some mango trees are monoecious and do not require cross pollination to produce fruit. The taproot of the mango tree delves deep into the soil below ground, to a depth of around 20 feet. The tree’s feeder roots also send anchor roots downward, to a depth of several feet. Mango trees cannot tolerate frost and grow best in temperatures of at least 40 degrees F and preferably above, and in warm and dry conditions. Temperatures below 30 degrees F are likely to damage the mango tree. They require soil with good drainage and a sheltered area with full sun. The panticles eventually bear the mango fruit, with each panticle stem often holding two mangoes or more. 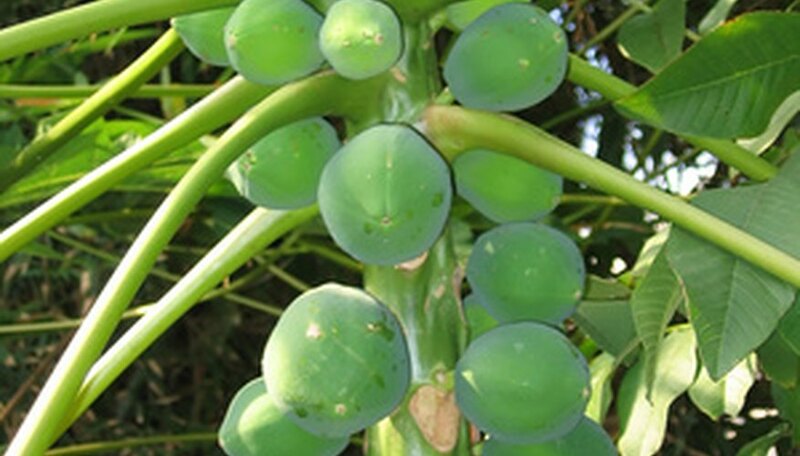 The fruit measures between 2 and 9 inches long. When the mango skin turns pale green or yellow, this is a signal that the fruit is ripe. Mangoes can weigh from 8 oz to 24 oz . 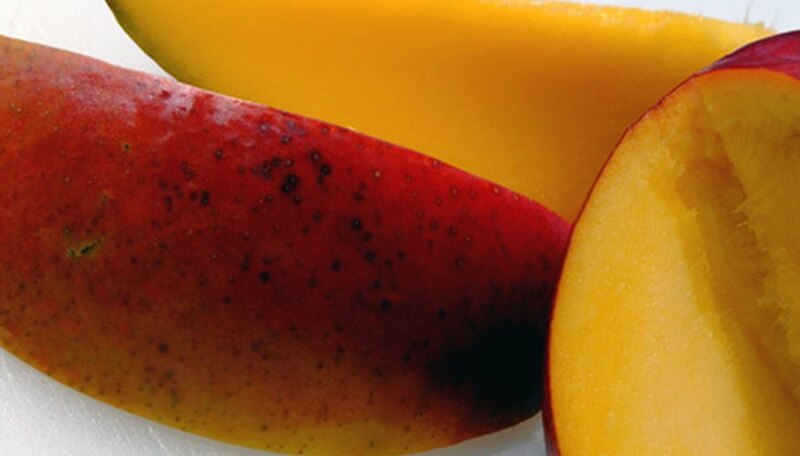 Mango products include dried mango, juice, puree, glaze, preserves and frozen mango. The mango tree has special significance among Hindus. In religious terms, the mango tree is a manifestation of the god, Prajapati, the lord of all creatures. Mango leaves decorate rooms where marriage ceremonies take place. Considered to be sacred, the wood from mango trees is used on funeral pyres. The flowers of the mango tree are offerings to the moon during the month of “Maagh” in the Hindu calendar (usually the 11th month of the year) and to the Indian god of love, Madan (similar to Cupid). Some mango trees can live longer than 300 years and still fruit.